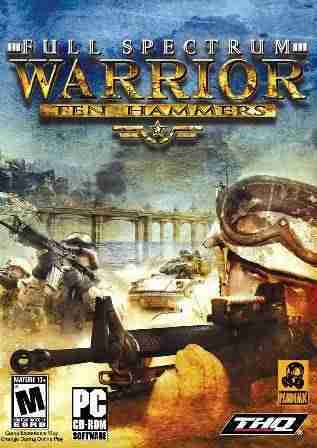 Full Spectrum Warrior: Ten Hammers improves on the ground-breaking and authentic military gaming experience, with more squad-based/real-time tactical combat. As squad leader, youll coordinate the actions of multiple infantry squads, leading them through a variety of hostile environments. Outthink, outmaneuver and outgun enemies through more than 12 levels of intense urban warfare. Use real-world combat tactics to command infantry squads, ranging from US Light Infantry and US Ranger Forces to Multi-National UN Coalition Forces as you face deadly enemies. With an enhanced multiplayer mode, players can go online and battle through new head-to-head and team-based objective missions. Play in Co-Op mode, or go head-to-head with other players or team up for objective based missions. - Command responsibility - The lives of the squad members lie in the players every movement and decision; in-game replay video system, allows players to evaluate their squads combat effectiveness and learn from mistakes.